And pick out an MPS INSERT that you like [that is, if your using an MPS pummel. ], to cap the pummel end. As for the Blade holder side... Check to see if it automaticaly added the "Heatsink $8" to your shopping cart when you chose the blade holder. That should make a satisfactory cap on that end. "Just try to picture activating a lightsaber WITH OUT the sound effects in your head... It just CANT be done!" Just wanted to say, this sirte is pretty great. I haven't bought anything yet, but from shopping around, this site is pretty good for a beginner like me. Thank you...looks like it is time for another update to this thread. I will try to get to it this weekend. I just wanted to say THANK YOU for the information here. I had an idea for a saber years ago that I never pursued because A) the tech wasn't really quite there at the time and B) expense and C) I felt it would have taken me too long to figure out the electronics. Looks like I'm out of excuses now! The dream shall become a reality. Ambition is opposed, but ambition can overcome opposition. Achievement of ambition creates more energy than it consumes. Conflict is eternal but can be mastered. How do you know which size blade to get for your blade holder? 1" or 3/4" ??? All of the blade holders in the store are machined to hold 1" blades. If you want to use another size smaller than that, you'll need to find an adaptor. THANK YOU so so so so much. I'm building a surprise lightsaber for a Christmas present with NO CLUE what I'm doing and have had to teach myself EVERYTHING. I have not left my computer in 3 days......but out of all of my friends I'm probably the only female who can now understand any of this! hey just wondering, using the basic wiring kit, how do i add sound? i'm looking at the MWS Pre-Wired Nano Biscotte Sound Module, but that seems like it has leads to go to all of the other components, but these already exist using the basic wiring kit, no? could i just use the basic wiring kit + http://www.thecustomsabershop.com/MH...lder-P766.aspx + http://www.thecustomsabershop.com/Na...-V1-P806.aspx? 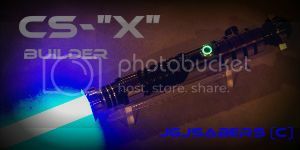 or to save some cash, i have the soundboard from an Anakin Skywalker Ultimate FX LED lightsaber from walmart; could that just be wired in using its battery pack and speaker? or if not, using the above wiring kit + those 2 links, would i also need a buckpuck or anything else?